Facebook Ditches Old Settings… Again. So, the other day I got this email from Facebook. I knew the change was coming. I had known for a while but, like most other Facebook changes that are gossiped about, I thought it wisest to leave it until it was officially confirmed by Facebook. 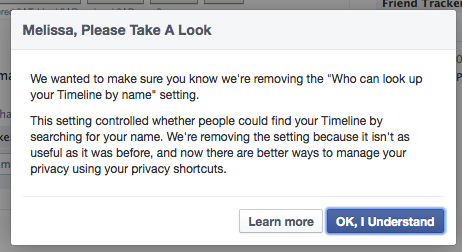 I knew exactly why this setting was being removed, even before Facebook decided to tell anyone. What I didn’t count on was no one else picking up on the possible implications of it all. Well, now it’s on like Donkey Kong. So, what does the removal of this setting mean for the average Facebook user? Not much… Unless you like privacy and are lazy in locking down your privacy settings. Basically, this change is being made to make way for Graph Search. Haven’t heard about Graph Search? Watch this space. I’ll tell you about it real soon. In a nutshell, Facebook’s Graph Search is going to allow for more personalised search terms to be entered into the search bar and yield results which you might think strange. Rather than searching through your friend list for all your friends who like a certain band, then looking through them to find out who also likes another band, you will just be able to type into the search bar: “friends who like band x and band y” to get your results. On face value, this seems fairly innocent, right? Right. Except for the fact that this information is being obtained from the 6 petabytes of user information that crosses the Facebook servers every day. If you haven’t already taken a look at your security and privacy settings, to limit who sees what you post, I would suggest doing it now. I would also suggest limiting your past posts. Another thing I would suggest doing, which is going to take you a little time, especially for those of your with large numbers of people in your friend’s list, is to start creating friends lists, if you haven’t done so already. This is going to make sure you can pick and choose who sees what with a little more control. If you have no care about who can see your personal information, then as you were soldier. If you’re concerned that your personal information might be seen by people you have no association with, then I say to you: Either lock down your profile or get off Facebook altogether. This morning when I logged in to Facebook, I had this pop-up in front of my newsfeed. This entry was posted in Rant, Social Media and tagged FaceBook, privacy, settings. ← The Cloud is not as safe as you think it is.